Pickl-It Jars, are they worth it? I know many of you have been patiently awaiting my review of the Pickl-It Jar. I wanted to try a few different ferments in them so I could really get a feel for how they work and give an honest review. Before I go further you should know I am not affiliated with Pickl-It and do not make any commission off of any sales. I will be honest I’m in love but am now torn. I’ve been using the mason jar/whey method for years and many of my favorite books and bloggers endorse that method and stand behind it. But the more I learn the more I see the very best way to ferment is in a truly anaerobic environment and at this time that means a Pickl-It Jar or a Harsch crock. That’s it. I’m normally highly skeptically when someone tells me “This is the only product out there…” If fact, I’ll do whatever I can to avoid using it. Yeah, I’m stubborn. But it’s true. Any other system available now just is not as air tight as these. I could go into it all but thank goodness KerryAnn from Cooking Traditional Foods did it for me with this great post Pickl-It vs. Mason Jars. I really wish my DIY lids would be a viable option but it was brought to my attention that we just don’t know if the plastic will leach toxins into the ferment and I don’t feel comfortable using them at this time. Close but no cigar. Why an anaerobic environment? The bacteria that we want are LAB’s (lactic acid bacteria) and these thrive in a salty anaerobic (no oxygen) environment. If there is any oxygen available, other bacteria that we don’t want can take hold. Skimming of the mold on top isn’t adequate because the mold does extend down further into the brine/veggie mix that you can’t see. If we use a mason jar, even with the lid tightly screwed on, it’s not tight enough to keep air out even with an airlock. Without an airlock if you don’t burp it the jar will explode. When you burp the jar, guess what? Air rushes in. It’s really not an anaerobic environment even if everything is submerged in the brine. This is not opinion, it’s fact. Sometimes I don’t like facts but that’s just how it is. In the weeks I’ve had the jars, I’ve made kefir, filmjolk yogurt, carrot sticks, shredded ginger carrots, cauliflower and I have curtido and dilly green beans bubbling away right now. Everything has turned out beautifully and I plan on updating you in the months to come to let you know how well the ferments hold up. If something is fermented properly and cold stored in an airtight container, it should last much much longer. I look forward to seeing how well they hold up. I just threw out a jar of cauliflower that was forgotten in the back of the fridge. It was about 6 months old but had gotten very discolored and gone mushy. This should not happen with a good ferment. Does this mean you can’t ferment in mason jars or use other airlock systems? Of course not but just be aware of the concerns. There is a risk that a bad bacteria could take hold instead of the LAB’s. You just don’t know what bacteria is growing in an open system. Many people have seemed to benefit from fermented foods from mason jars. The Weston A. Price Foundation rates foods by good, better, best and I think we can do the same here. Better: Other airlock systems that use thick rubber gaskets. If it weren’t for the concern about toxins, I would rate these as good. But that really doesn’t seem to do the jar justice. This graphic is more accurate. If you are dealing with gut issues that you are trying to heal, I strongly suggest getting a Pickl-It Jar. The difference can many months of healing. If you are on the diet, it is imperative to use a probiotic and a good one can be spendy. I’ve consulted with KerryAnn and from my own research and hers, we agree that a Pickl-It Jar creates enough probiotics to not need a supplement. I don’t know about you but that is good news for me. A good probiotic for everyone in my family of 6 would be a lot of money. Purchasing a bundle of Pickl-It Jars is a one time purchase that would end up saving us hundreds of dollars. In short, I don’t plan on fermenting in anything but a Pickl-It jar from now on (unless I find an awesome deal on a Harsch crock). As a side note, kombucha should not be fermented in a Pickl-It Jar. Kombucha does need oxygen to ferment properly. The same goes for apple cider vinegar. 110 comments to Pickl-It Jars, are they worth it? The jars aren’t cheap for sure but I think they are worth it. I resisted getting any for a long time because of the price but it is a lot cheaper than a Harsch crock and the ferments do last considerably longer. I just threw out a few jars of older ferments that would have been fine if they were in a Fido or Pickl-It jar. And if someone is looking to do fermentation for gut healing, they are definitely worth it. Kombucha would definitely be much better than diet Dr. Pepper. I used to crave soda pretty badly. I just really like the carbonation. Drinking kombucha and water kefir helped get rid of that habit. Now I’m not even tempted by it. I had a soda a few months back and couldn’t finish it because it was too sweet. Woohoo! I have the 1 1/2 litre, 3 litre, and the 5 litre Pickl-it jars and I love them. They make the best pickles and kraut. Yes, they are kind of pricey, but they are a quality product. Got to order more soon. So happy to find your website and can’t wait to dig deeper into the nourishing foods you make! We recently learned about the necessity of fermented foods for healthy digestion on a quest to help our sons’ food allergies. Cool to see that you are a mom of boys (I have 3) and are homeschooling…something we are going to try out over the summer. I’ll for sure be following your posts! Let me know if you have any questions at all. Feel free to email me at melanie@picklemetoo.com. I hope you love it like I do! What makes you put the “better” so close to the “good” end? Just curious! I would think it would be closer to the “best” range on the scale. The reason I did it that way is because I do think the lids I made (if we were sure they didn’t leach toxins) are a step up from either an open bowl or even the burping method but they are far cry from the Pickl-It or Harsch crock. At least in my experience. With the DIY lid, when stored in the fridge I noticed eventually the fermented food became discolored and mushy and that’s not supposed to happen with a Pickl-It. That shows me air is getting in. Mason jars are meant to seal with vacuum not the reverse (air pushing out from the inside). Now someone brought to my attention a cork method that intrigues me. That one I might put closer to the Pickl-It or Harsch crock. At this time I see no reason why it wouldn’t be effective. Why not use the white Ball plastic jar lids (not for canning)? This is what I had done independent of reading your post (I just came to it now in a search to see if Pickl-It would sell just the glass lid w/hole, as I also have a bunch of Fido jars. Apparently they will not and are interested only in shipping the whole Fido jar setup to us). I got the white plastic lid idea from here: http://blog.kitchentherapy.us/2011/09/how-to-make-an-airlock-cap/ , *except* I changed to a silicone bung (called a #2 drilled stopper, which required I use a 5/8″ drill bit for the hole) from my local homebrewing supply store. I also bought some glass airlocks to go along with my plastic ones from the brew store. Anyway, the Ball white plastic storage lids are made (in China, hmm) of polypropylene, which EWG says is safer than BPA-containing plastics. “Safer” is not “safe” like glass, but for those who are inveterate DIYers and also on a serious budget, you can’t beat the low cost of Ball jar (~$1.75), white storage lid (~$0.60), drilled bung/stopper ($.60) and cheap plastic airlock (which is the same that Pickl-It uses, btw, at $1.50 from the local brewing supply store). These storage lids are airtight when screwed on tight, as well, and are meant for storage use with Ball jars after the metal lid’s seal has been broken. I bought some airlocks, drilled through the metal lids, put in a gasket, and put in the airlock. Beeswax as a filler or sealer was recommended to me; I saw some space where water came up near the gasket, so when I get a chance, I’ll melt some beeswax near there. Right now I’m not even using my re-fitted lids. Some small glass bowls will completely dip into the tops of mason jars, making a completely airtight seal. If there are any burps, by big jar is in a large bucket,the small bowl can handle it, and I can readjust the brine level as needed. I do the same, but drill a larger hole and use a rubber stopper with airlock hole in it from a home brew store. If the food is not touching the plastic, I feel it is safe. No one ever mentions if the airlock plastic is safe…which I find odd as it is just as exposed as the plastic lids that are apparently so awful. The point you were trying to make was very obvious! I wonder sometimes if people read properly before they comment. Thanks for the detailed review. I’m surprised that some of you think the Pickl-it is expensive. You can buy a whole set for less than the cost of a Harsch crock! I used to think they were until I saw how much a Harsch was 🙂 Comparing them to a mason jar, yeah they seem expensive but the end product is worth it to me. I am just starting to do fermented foods is there a website or book that you would recommend? The Pickl-It website is full of great information as well. Kathleen really researches her stuff. And KerryAnn of http://www.cookingtf.com has a series about lactofermentation that has been very informative. Off the top of my head, those are my favorite books and sites. Hope that helps! I have two Pickl-It jars, and overall I am quite happy with them. My only issue with them is that compared to my Le Parfait jars, I find the Pickl-It wire clamp down a bit flimsy. Shortly after I got my Pickl-It jars, I came across a Lacto-fermenting Air Lock System from the COOKING GOD’S WAY website. It has a rubber gasket similar to Pickl-It and screw on lid with grommets that fit wide mouth canning jars and an airlock. And as you might guess, much less expensive. I use both types for fermenting with good results. I was wondering if you are familiar with the COOKING GOD’S WAY system, and if you have any ideas or opinions regarding them. The other system you are referring to is like the DIY lid I linked to, right? I’m not sure about that one leaching chemicals because they are made with a different plastic but the same problem happens with these as with the ones I shared. A threaded mason jar just doesn’t get as tight. I was told that a thread jar would never even be considered for being certified hermetically sealed (air tight). You still get a better seal with Pickl-It type jar. I wonder if there is a way to tighten it if yours is too loose. As an owner and co-creator, tester and user of the Lacto-fermenting Air-lock System at Cooking God’s Way I can vouch that the system we offer is an air-tight anaerobic system. All parts are BPA-free plastic and natural food-safe rubber. The gasket included in our kit makes the system air-tight. I have been using this system for years. The reason we created this system was so that everyone could make healthy, properly fermented foods no mater their budget. FYI – once an air-lock is employed in the fermenting process the pressures within the jar are just slightly greater than the atmospheric pressures outside of the jar, this is because it is being vented through the air-lock. So in this way a plastic lid could easily withstand the slight pressure that is within the jar. Flip-top spring loaded lids are only needed when the fermentation is done in a closed system (with no vent) such as beer, homemade soda, etc. Hi Shannon! I’m happy you stopped by and am grateful for your input. One thing I do keep going back to is the fact that mason jars are meant to be air tight in a vacuum situation, not with internal pressure. But, with an airlock, I can’t imagine the internal pressure ever getting up high enough to allow air seepage. What I’d really like to see is actual numbers of LAB’s in a ferment. Is there a big difference between a jar that is certified hermetically sealed and a jar that might not be hermetically sealed but “good enough”? Melanie, can you explain what you mean by “with an airlock, I can’t imagine the internal pressure ever getting up high enough to allow air seepage” ? Stay tuned. My testing will begin in two weeks or so and I will let you know. There is so much I’m still learning. What I meant by that sentence is simply I can’t imagine oxygen going into the vessel under the gasket that’s locked down by a lid ring. The air leaves easily it’s whether air get in that I doubt. But then that leaves what I mentioned in my other comment. What about after the active stage when there isn’t as much pressure? Can air make it’s way in then? Yes, I can’t imagine that, either – air just won’t force its way through the gasket when there is an airlock in place. It certainly isn’t getting in. The CO2 causes a certain amount of pressure always pushing out, preventing oxygen from penetrating. Air still won’t make its way in due to the vessel being full of CO2. Mine finally arrived yesterday and I’m pickling the remaining 2011 garlic right now. I had been searching for a way to ferment when I stumbled across you blog. I’ve had stuff go very bad in Mason jars so I’m looking forward to this system. Ooh, pickled garlic! That is one that just keeps getting better and better with time. I can’t wait until I have more garlic to pickle. Kombucha you for sure want to have access to air. Oxygen is part of the fermentation process. I hear mixed things about kefir. Since yeast is part of the grains, it seems to me they would do better with access to air but I hear others say it works best in an airtight system. So, I’m not sure. I do mine lidded loosely. How long have you had your water kefir grains? Sometimes it can take time for them to take off. When mine would do that, I would just throw the water out and start a new batch if it tasted too sugary. Honestly though, I have not had good luck with water kefir. I think my house is too cold for it but I’m not entirely sure why water kefir doesn’t like me. There is no way this is possible when the pH drops. Bad bacteria can’t survive! Open-air (cheeseloth-covered) – you’re right on this. But a mason jar with a lid like the Cooking God’s Way system – that is as effective as a Fido jar with rubber gasket. The oil pH is not affected by the ferment and some bacteria can live in oil. That’s where the concern is. I’m still not sure on the mason jar systems. Yes, during active fermentation oxygen will be pushed out but what concerns me is after the pressure is gone when the activity dies down. A threaded system, especially with a plastic cap (even with a gasket) just doesn’t seem like it is truly airtight. Threaded jars are not ever considered hermetically sealed. How much of a difference? I have no idea. I can’t wait to see what you conclude with your tests. With any system, once the CO2 stops being created by the LABS, it will stop being pushed out the top. But it will be full of CO2. And then you use it or put it in the fridge. Hermetically sealed is over-kill. That is not the aim here. Threads don’t really matter here if you have a lid that has a gasket, screwing on the cap tight will push that gasket down tight preventing any CO2 from escaping, and certainly any oxygen from coming in through the threads! The airlock is the weakest point and that is where the CO2 will push out. Oxygen can’t penetrate this system. “threaded system isn’t hermetically safe” is true but a moot point when we’re talking ferments. I think too much attention is being focused on red herring-type details and the bigger picture is not being seen (not from you). Think about it, really. The lid squishes the gasket down. It doesn’t matter how the lid is squishing down, it is squishing down. The threads could have holes and it wouldn’t matter. The gasket is smashed on top of the glass mason jar rim, preventing any air from being exchanged. Now a plain white lid, sure, it’s not air tight. We know that because they leak. Before I was worried about any toxicity with the Tattler lids, I did use them for ferments and for storage. For the active fermentation stage, they appeared to work brilliantly but storage, not so much. The picture on KerryAnn’s post about oxidation is of a ferment stored in the fridge using a Tattle lid, gasket and metal band but has major oxidation issues. It was oxidized after only a week or so in storage so it wasn’t an issue of the jar not being full enough. That’s proof enough for me that air does in fact get in a mason jar with a gasket. For people who aren’t trying to heal major gut issues, I have no problem telling them to use mason jars but for people who want to see big improvements I think are better off using Pickl-It’s or Harsch crocks. There very well be a difference between the Tattler and the Cooking God’s Way system. Not all gaskets are created equal – the CGW gasket is much different than the Tattler. I do agree the metal lid and band do seem to be tighter. I will be testing a metal lid and band with an airlock and anticipate it will do well. I hate knowing, too 🙂 I can’t wait to get started. I need to hear back from my microbiologist friend (very busy man!) and then I can place my order and get started. I plan for this to be first week of June. I do agree those with gut issues will be the most sensitive and will notice right away when oxygen gets in there. Others…it will take longer. I read Katz’ ‘Wild Fermentation’, and have also surfed around ‘pickle me to’ and been so inspired by your recipes! After contemplating the ‘picklit’ jars, I surfed around the net some more, and decided that I believe in the unitarian universalist method of fermentation! No special equipment needed, really, except clean and hygaenic methods. I bought some air locks and gaskets at Whole Foods and rigged up some mason jar lids with them but haven’t tried that yet. A food grade plastic barrel with a plate and heavy bowl inside made perfect dill pickles. A small size mason jar filled with water sitting inside and on top of fermenting vegetables works fine! Kefir grains are happy in a larger wide mouth mason jar, sealed or topped with cheesecloth under the ring. People have been fermenting all over the globe, probably from time immemorial, in all kinds of vessels! Yak skins and animal bladders, wooden barrels, glass vessels, ceramic crocks, and state of the art 21st century convenient parephenalia. All work! I’d rather buy more eggs or vegetables for the next ferment than more jars for the shelves in my small fridge and small kitchen! Hi. I am just discovering fermented veggies and after lots of research had decided to purchase the Perfect Pickler lid/jars. Then I found your site and revie of the Pickl-It system. Have you used the Perfect Pickler and do you know how they compare to the Pickl-It system ? While I think the Perfect Pickler and other lids like it are definitely a step in the right directions and much better than open air fermentation, I still think they are far below a Pickl-it for a few reasons. First, even though they are BPA free, plastic is still full of chemicals and toxins that we just don’t know how they react with ferments that put off gases and are acidic. I’m hesitant to use any plastic at all with my ferments. Secondly, threaded jars just don’t make as good of a seal as a wire-bail jar like a Pickl-it (which are made out of Fido jars). I haven’t seen the Perfect Pickler’s gasket to see if it’s good or not but from the picture, it doesn’t look thick enough to me. And as far as price goes, a 1L Pickl-it (close in size to a quart sized mason jar) is $23. To get a Perfect Pickler lid, it’s $19.95 and that’s just the lid (and a booklet). For $3 more, a Pickl-it is so much more worth it. For those of you that are interested in a more economical way to get a glass lid to ferment in, I drilled a hole with a diamond drill bit($10.00 -$20.00 at Lowe’s)into the glass top on a Fido bottle. Inserted a food grade grommet and air lock. Later I stopped the hole after fermenting with the plugs from Pickle It . It works perfect! When drilling the hole you have to use a piece of wood to guide the drill because the first cuts don’t grab the glass very well. The wood holds the drill bit in place until it gets a grip on the glass. I bought the Fido bottle at a discount store some of you may know called, Ross. They were only $4.00 for a 2 L jar. That is right, $4.00!!! Another thing I noticed with the glass lids. You have to watch to make sure the wire is grabbing tight enough. I have had this problem even with the Pickle It jars. I’m actually working on a post about that right now. Basically the answer is I don’t know. Fidos will release CO2 after it’s built up. What I’m not sure about is the effect a build up of CO2 has on a ferment. One thing I will say is that I do think fermenting in a Fido is definitely better than a mason jar. I am sure of Pickl-it’s which is why I still will recommend them over a Fido until I know for sure. ture and exposure time, and with decreasing working volume ratio. Microbial reduction of 5 log cycles was observed within 200 min under a CO2pressure of 70 kg/cm2at 30 °C. It was suggested that cell death resulted from the lowered intracellular pH due to penetration of CO2, rather than physical rupture of cell walls due to the high pressure of CO2. The experimental results suggested that high pressure CO2treatment could be used as a potential nonthermal technique forkimchipreservation. Now this shows LAB death, but that is a LOT of pressure – way more than you can get in a Fido. This is one thing about research that drives me up the wall. It seems you can find anything to support whatever you want to believe. I have just as many sources (more even) that imply the impact of CO2 build up could be a bad thing. Once I sort through everything (pros and cons), I hope to come to some sort of conclusion. All the research still leaves me with more questions. Kind of makes me wish I was a microbiologist with access to a lab, lol! There is only so much a kitchen experiment can tell me. Anyway, thanks for these articles. I’ll be sure to go through them too. In the end though, I’m sure the any bad effects CO2 can have on a ferment is less than what an open air system would produce. If I had to choose between an mason jar and a Fido, I would definitely choose the Fido. But the price of getting a few Pickl-it’s is worth it to me knowing that I am getting an awesome ferment for sure. No second guessing for me. I am new to fermenting and have a question. I want to ferment chopped carrots, brocolli and califlower. I will be using a 1 quart jar. Do they just need to ferment say 4-5 days or longer ? And, do I need to cure them in the frig for a while before eating or will they be ready once fermenting is complete ? So the reason my stuff has mold constantly is the mason jars? I have been wondering about this. My friend told me to just scrape it off, which I did after storing it in the fridge, but noticed the next day it was back but worse. So if I use the Pickle it jars it wont mold? Where can I purchase pickle-it jars? The people at pickle-it never return my phone calls. Pickl-it.com is the only place online that I know of. She does have some resellers in various locations but I’m not sure how you would go about finding one in your area. I know they are back logged with orders so I’m not sure what to tell people (I hear this often). I love the Pickl-it jars but their customer service is non existent from my experience. I contacted them via email regarding a stopper received with several jars that was the wrong size and no response. I have also called on a couple of occasions with other questions and no reply. So though the product is good..buyer beware..too bad because their jars are very nice. Sorry to hear you are having customer service issues with pickl-it, but at the same time it’s great to know that I’m not the only one! 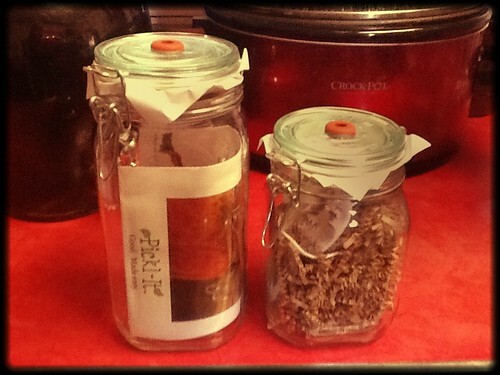 The lovely Leslie at Seasoned Homemaker has written a blog post about making your own identical product – http://www.seasonedhomemaker.com/2012/10/how-to-make-your-own-low-cost-pickl-it.html. I’ve recently bought a five pack from pickl-it (intending on that lasting me for life along with my harsch crock) but due to the disappointing customer service experience (no reply for 9 days regarding a product that came broken due to bad packaging when I was also asking a question about a subsequent order, and then being insulted by the owner of pickl-it in this response ), I can not in good conscience refer any of my friends, family or blog readers to buy from pickl-it. I have since bought all the equipment Leslie has described in her post. I’m going to make these fermentation vessels for my friends and family. I would recommend you considering doing so as well i you can! Please feel free to contact me if you want me to make some lids for you and post them. As noted above fido lids are interchangeable so the shipping of the lids would be WAY less than the shipping of the whole jar. Thanks for your comment Dan. Sorry you’ve had such a bad experience. You’re not the first I’ve heard. I am beginning to think making them isn’t as bad as I initially thought. Good luck with making your own! I have made my own and the grommets that the seasoned homemaker used are by far the best. I use a regular drill and a block of wood that has the same size hole in it. This is used to guide the flat tipped diamond drill bit through the wood and then to the glass. Making it less likely to slip and slide on the glass. I am also disappointed with Pickl-It customer service. They shorted my order by $50 worth of merchandise and have not returned my emails for over 3 weeks. Plus, one of the cheap plastic airlocks arrived broken and another broke after one hand washing. The Primal Kitchen (which sells The Boss Pickler) has OUTSTANDING customer service. I highly recommend them. I got just the lid and the airlock system from a company called *Cooking God’s Way. * Then you just have to purchase the mason jars. I live in Canada, so it was a whole lot cheaper for me to do it this way. The service was prompt and the system works well. Want to do the same thing for less than $1? Add 1/2 inch of oil on top of your jar. This keeps your ferment covered, locks out air and other bugs, allows fermenting gasses to escape and stops evaporation of your brine. My mother said that is what my grandmother used to do and I couldn’t figure out how. Thank you for this brilliant comment! I’ve been told that using oil on top of the ferment increases the likelihood of botulism (which can only survive in a completely airless environment). Airlock fermenting doesn’t remove all gasses from the environment, and that provides some protection against botulism. My mom said that my grandmother put oil in the ferment but I never got it. Now I see the oil was on top, to seal. There is a risk of botulism surviving in the oil but I’m not sure how much of a risk. Just curious, I don’t can as much as I used to, I am not only divorced now, but also disabled & just don’t have the need. On the other hand this article interested me, but after reading it, my question is: Does everyone have a spare fridge they use to store all of these items? Definitely not. I’m the only person I know of who does 🙂 But I have a family of 6 so we need 2 refrigerators anyway. Ferments can be stored in a regular fridge just fine and if you have a cellar, they store well there as long as it’s below 55F. I discovered your website a couple of days ago. I’m preparing myself to start GAPS but I am too intimidated by the lacto fermentation. I would like to try the pickl-it jars next time but since I had bought cabbage already I decided to give the mason jar a try. I started my sauerkraut today but I want to make sure that I maximize my chances of success. What is the appropriate way to release the pressure from the jar? is it opening all the way or is it rather more like twisting it a bit so that the pressure gets released? Does it have to be in the dark? (I put mine inside a cupboard). When you push on top of the jar when there is no pressure inside, it will easily flex down with a pop. When pressure builds up, the top will push out. When you push on the top and it doesn’t flex, that’s a good time to release the pressure. I just loosen the ring enough to let the pressure out and then tighten it back up. The bacteria is sensitive to UV light so it’s best kept in the dark. A cupboard is perfect. Thanks for answering so fast! how/when would I know if the fermentation went well? Do you sell a 4 or 5 L size? I also would never recommend pickl-it to anyone! The owner provides the worst customer service!I ordered these jars for a Christmas present and even paid extra to get them before Christmas. Not only did they take my money, but the jars didn’t arrive until January 15th! We attempted to contact her daily over a 18 day period and got no response back via email or phone. She did nothing to make the situation better, when we did finally reach her. Karen’s attitude was completely unprofessional and clearly doesn’t appreciate your business! CONS: I did not feel these jars did anything more than my crock or a regular mason jar. They are cheaply made and constructed with thin plastic, yet extremely over priced. I would spend your money on any other product then hers. I keep hearing this more and more. Very frustrating. I’m beginning to pull my recommendations because this has become such a pervasive problem. I too had a horrible customer service experience with them. I purchased 2 5L jars and 3 weights from them. Boy what a waste of money, that purchase alone was over $100. Since then I have purchased 10 5L Fidos from Sur La Tab for less than my purchase from the Pickl-It site. I emailed them SEVERAL times to find out if and when my order had been shipped and of course I never got a response. The only thing they weren’t slow on was charging me. How have you ordered from this company? I have called several times, emailed and NO response. Unbelievable that a company can function like this! I wish there was another source because I LOVE our 4 liter jars for Water Kefir. Any suggestions? Thank you for letting me know about this. I keep hearing this over and over and I no longer recommend Pickl-it based on these experiences. I’m hoping there will be more options soon. I’ve had a chance to look at this product (review coming) and have really liked it. It’s based off of a fido but with a waterless airlock. Works great for me. http://ow.ly/n9I2A (This is an affiliate link). I simply use a plastic cap that I bot on amazon, drilled a hole and inserted grommet/airlock. I don’t know if the plastic cap is a perfect seal or no, probably not. In fact I don’t even twist the cap tight enough for best seal. I have been fermenting for 4 or 5 yrs and I have never had a bad ferment yet. At least not that I know of. The resultant food is delicious so the seal must be air tight enough for a good ferment. If the lid has fermaldehide in it as does the tattler I don’t want to know about it. I also have a crock for bigger batches of sk. I use a food grade plastic bag filled with water for sealer. Perfect kraut every time that i refrigerate from nov to aug of following yr. Eat it every morning with hard boiled egg. Just as good today as it was last yr. I just ordered the lids (wide mouth) and the top unit only from the above company..I`m in Canada, and shipping charges are prohibitive.. can`t believe it–$91 to ship two single units of the Pickl-it into Canada!!! the problem now becomes where can I find large wide-mouth mason jars.. I may be doing small scale for a bit I think..keeping my fingers crossed that I eventually end up with something that works well for me. After making the fermented food in the pickl it jar, am I to assume that it’s OK to transfer the food to an airlock jar for longer term storage? That is, as long as the fermentation is complete. If a person is worried about a mason jar lid leaking it seems pretty simple to solve. Turn the jar upside down after the fermentation. Nothing in the jar could possibly create a force to pull air through X amount of liquids that wouldn’t break the glass. I just used my pickl-it jars for the first time and there was no “sizzle” when I opened the jars. I’ve used mason jars prior and there was always tons of bubbles when I opened the lids. Just wondering if this is normal………….?? Thanks! That’s actually good proof that it’s doing what it’s supposed to do. The sizzle is from build up carbonation which can have a negative effect on ferments. Since the gases are released through the airlock, it doesn’t get pushed back into the ferment. No sizzle is a good thing. Thank you for the post Melanie! I appreciate how you rated them as good, better and best! I am just getting into ferments and I have only done water kefir and kombucha but I am eager to add more to my diet. I have a great concern about mold, I am extremely sensitive and have issues with candida so it sounds like the pickl-it jars might be a good idea for me. Do you have an opinion of the probioticjar? Hi Candace! I do not have a Probiotic Jar yet but I have only heard good things about them. I do plan on trying them out soon so I can see for myself. I’ve read on the Cultures for Health website that different ferments (i.e. kefir, yogurt, sauerkraut) should be kept several feet apart to prevent cross-contamination. However, this was in reference to fermenting using mason jars or crocks, and there was no mention whether this measure also applied to Pickl-It/The Probiotic Jar/The Boss Pickler fermenting vessels/jars which have either a water-based airlock or silicone valve airlock to keep oxygen (and I assume also potentially contaminating microbes) out. I am guessing the “several feet apart” rule does still apply to kombucha since there is no airlock because it requires oxygen. Can you please advise? Thank you! You are correct! That’s one of my favorite things about jars with airlocks, no risk of cross contamination. I do keep my kombucha in a different room than my other ferments since it is open. I don’t worry too much about it because kombucha is a pretty wild ferment. Everyone’s culture will be slightly different based on the bacteria floating around in the air and the water where they live. If a little water kefir culture gets into it, I just think of it as enhancing it. The other way around though, isn’t as great. If kombucha (or vinegar) contaminates a water kefir culture, it can take over and make your water kefir taste vinegary. I was about to buy the Perfect Pickler then read your comments above comparing those and the Pickl-It Jars and was about to change my plan then read about the poor customer service of the latter and now am torn. I do want to say that I contacted Perfect Pickler in Florida this past weekend. I got a call back first thing on Monday morning directly from Bill who was very professional and a big help. He gave me both his phone number and email address and invited me to write with any additional questions. If customer service is a consideration (as it seems to be for many), there’s a big difference from what is described above with P-I Jars. Just wish the rating of the products were the same. After doing a lot of research and ordering the wrong jars from a DIY ball jar company, I decided to call Pickl-it and ordered their anaerobic jars. Contrary to what I have read here, I had a fantastic experience with the owner Kathleen. She called me right back after I left a message and spent a ridiculous amount of time on the phone with me answering all of my novice questions about fermentation and all the options out there. She is absolutely brilliant and is filled with pertinent information. Since that original conversation, I have sent her an email with another question that she answered right away and I called once more to add another size jar to my order and she answered my call. It has been a wonderful experience and I can’t wait to get my order and start fermenting in a oxygen free, safe environment. I just ordered my picklit and i had a very good experience i email them and next day they replied and the next day Kathleen the owner called. I will let you know how shipping was and the quality. We are all wanting the same thing here. Loved Nourished Living cookbook just received from Amazon. Pickl-It was the original anaerobic fermentation jar. I’m still loyal to them for what they taught the world re: the importance of anaerobic fermentation, and their innovative design using a wire-bail jar with airlock. I suppose it was inevitable that there would be rip-off products. I will trust with the original and the best for my family. I’ve noticed even with competition, and Pickl-It being the premium brand, nobody competes with Pickl-It bundle pricing! Thank you for revealing the dangers of any method other than a completely anaerobic environment which the Pickl-it offers. Hi. I have read a lot on the Cultures for Health site and was ready to dive in. I was just going to start with a mason jar and coffee filter cover and salt brine, and then maybe get their airlock lid to use on my mason jars. Now that I’ve read more here, I’m having doubts and second guessing. Before purchasing a bunch of equipment, would you suggest trying out fermenting with what I have on hand to see if it’s something I will be doing more? I don’t want to spend a bunch of money and then not use it. Thanks! Grateful to find this article today, and all the discussion. I haven’t fermented vegetables yet, but I saw a recipe yesterday that made me want to try. So I began digging, which led me here. My grandmother and great aunts used to make sauerkraut in great big pottery crocks. There was some kind of heavy, metal tamping-down lid, and I believe they sealed the top with paraffin-soaked dish towels. Best sauerkraut in the world! Their method seemed so simple. Your article helps me to realize how much science is involved in this process, and how much I have to learn before I throw some veggies and brine in a jar. Re-Thinking Lacto-Fermentation: Are We Flippantly Fermenting? I am so new to all this, still, though I have attempted a few ferments over the past year. So, if you wouldn’t mind helping a Truth-seeking novice, I have some questions. Firstly, if one were to purchase the Pickl-It systems, or another air-lock system, once the ferment is moved to cold storage, does it need to stay in this jar? Or can you move it to a mason jar then…. Also, I have used the lid and ring mason jars for sauerkraut, and some other ferments, and am muddy on this a bit…I thought some ferments needed to be burped–but you’re saying that ALL ferments should be anaerobic? I just want to be clear……if so, what then of things like kombucha (which I understand needs a cloth over it….I thought some other ferments required this also)? Also, I’ve often wondered if those seal jars (they look like the Pickl-It but without the doo-hicky on top) would be sufficient, or at least as good as the mason jar lids? How do they stack up? One more thing….I have sauerkraut that I made in a mason jar. It’s in the fridge, and there is a bit of discoloured bits (mold, presumably) growing near the top edge (only since being in the fridge), but nowhere detectable on the main part of the kraut…..at least some sources I’ve seen (and relied on) say that the mold from the top can be scraped off, even if it was growing right on the top of the kraut itself, and the rest is still fine. 1. What say you to this, because I’m searching for varied input? 2. How long is sauerkraut supposed to last in the fridge? I thought it was a long time…. I hope someone can get back to me, I’m just trying to sort all this out. You mentioned that your new favorite jar was The Probiotic Jar, above the Pickl-It. I currently have several of the Pickl-It and they do work well. Can you expand on why your new favorite is The Probiotic? I am fairly new to fermenting and just saw your review of the Pikl-It jars. Have you had a chance to compare these to the silicone methods of excluding air (such as the Pickle Pipes). They seem like a simpler solution and it would be great to see a head-to-head comparison to the Pikl-It jars. Beware of Pikl-it company. They charge a 25% restocking fee which is unethical. I complained to company after placing an order and they canceled my order and threatened legal action. What a jerk, Some nut named Jamie. Avoid them like the plague. I have been fermenting for 5 years, I make Fermented veggies, Kefir and Kombucha!I have tried many jars and crocks! I like Fido (PIKL-it jars are fido jars)and Weck jars the best, they are very well made have great seals replacement parts are easy to find.You can find glass airlock lids for both, although I did have to go to Ozfarmer.com in Australia to find the glass airlock lid for the Weck jars.Yes they are pricey but are very well made and you get what you pay for, I have not had a ferment go bad since I started using them.Before I bought a Harsch crock, I would check out Mark Campbells Ceramics in Arcada Cali.,he is an awesome potter and has gorgeous colors, I like his crocks better than Harsch, he also sells his pottery on Etsy.For Kombucha, I use a two and one half gallon jar, the kind you would set a two or five gallon jug of water on,I replaced soda with Kombucha also,I flavor it with organic fruit juice and drink two gallons every six days. For how to books and video go to you tube and type in Donna Schwenk,Sauerkraut.com, and Kombuchamoma they all have great videos,recipes, and how to books, Donna Schwenk also has a great DVD called the Trilogy, that explains how to make Cultured Veggies, Kefir, and Kombucha, its where I learned and have never regretted it.